Here I am again talking about summer fruit. I find myself doing that a lot of late on this blog, but I guess it will be gone in a blink of an eye, so I have to do it while I can. I am so excited to share this recipe today. 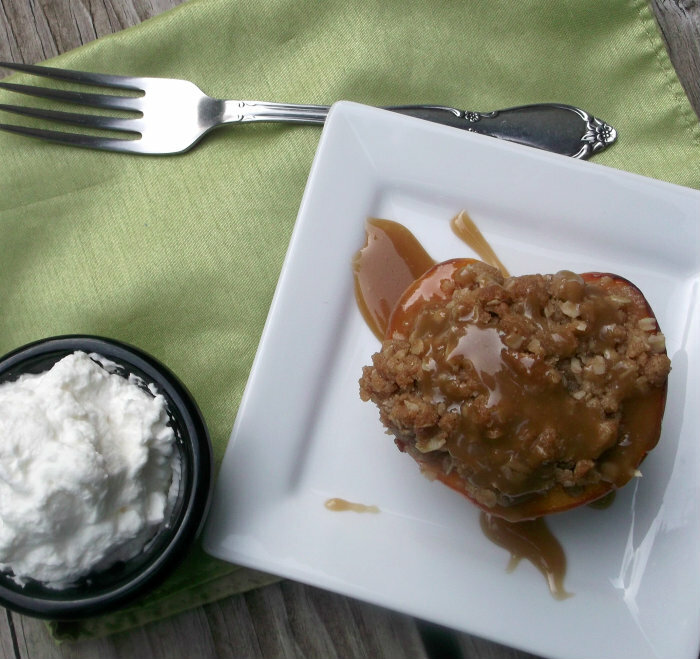 If you love peaches and streusel, you will definitely love this recipe. As noted in one of my past posts I have been enjoying the sweet juicy peaches this summer. I have been thinking of ways to add them into more of my baked goods. I love a good peach pie, but let face it I don’t always have time for everything that goes into making a pie. 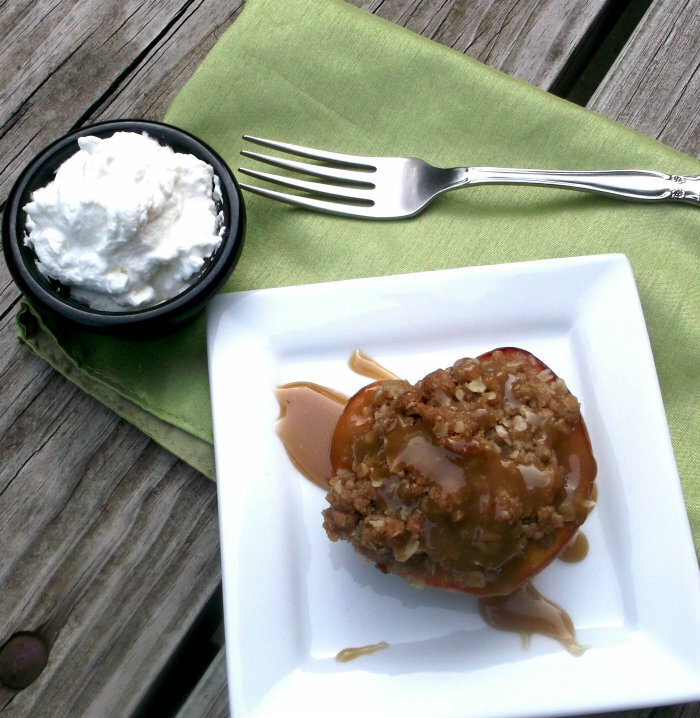 So, I found the next best thing, streusel stuffed baked peaches. This is one of those desserts that are so simple, but elegant at the same time. The peaches hold up nicely after being baked and the streusel give a lovely little crunch to the whole thing. 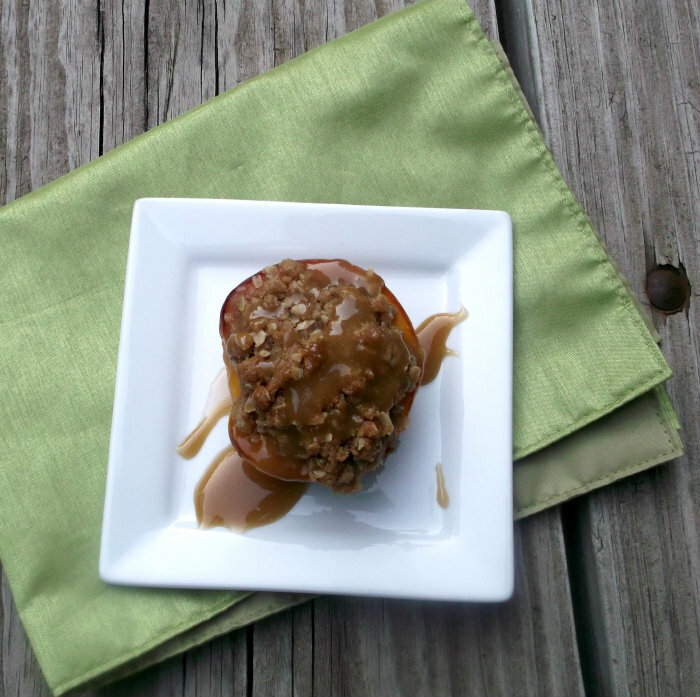 Let’s not forget the caramel it the perfect topping to bring all of the flavors together. Serve it with a dolop of fresh whipped cream or a scoop of creamy ice cream and enjoy. Take the flour, brown sugar, oats, cinnamon, ginger and mix until well blended. Melt butter and mix into the dry ingredients until well blended and set aside. With a sharp knife cut the peaches in half. Taking a spoon scoop out the peach stones, creating a little well for the streusel topping. Place the peaches cut side up into ramekin, custard cup, or you can use a baking dish. Take a 1/4 of the streusel and put on top of peach, gently pressing the streusel into the well that you made in the peach. Place in the oven and bake for 20 minutes or until peaches are soft and the streusel is slightly browned. You can check peaches with a pick to test. While the peaches are baking make your caramel sauce. In a small sauce pan melt butter. Add the brown sugar, corn syrup, and whipping cream continue to cook over medium heat stirring constantly. Cook for about 2 to 3 minutes just to thicken it a little bit. Take off heat and stir in the vanilla. When the peaches come out of the oven. plate them and drizzle the caramel over top of each peach. Serve with ice cream or fresh sweet whipped cream. Enjoy! What an amazing dessert! The peaches look fabulous. I can smell it in my head. It must be amazing. Wow, what a terrific recipe! This is really interesting – I haven’t seen anything like this before. Wonderful idea – thanks so much.